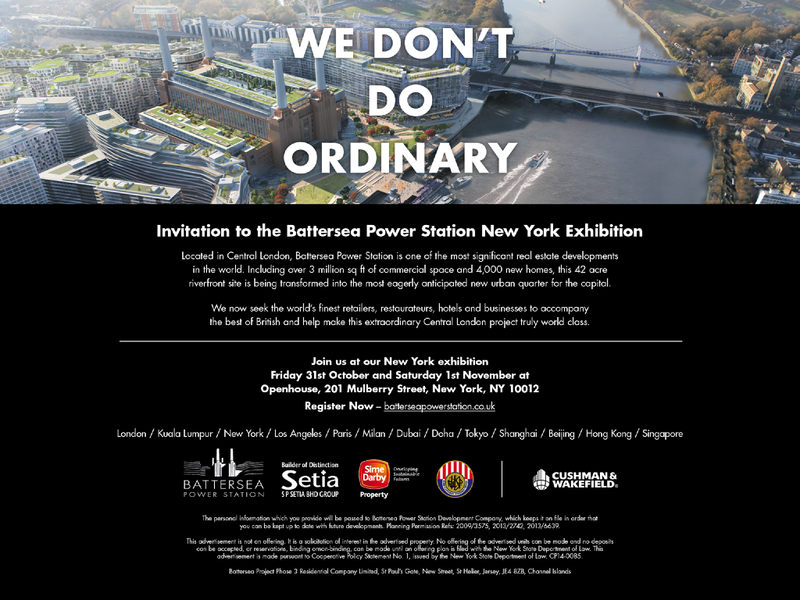 Battersea Power Station …. Clearly the place to be …. but at what price to current residents? just tap on ‘jebr’ and see what a fine representative job she is doing for her constituents. Yes, Battersea for is up for Sale …. in New York City, no less. And probably elsewhere too. So don’t be surprised when good old Battersea Park Road is re-named …. wait for it …… New York Road. 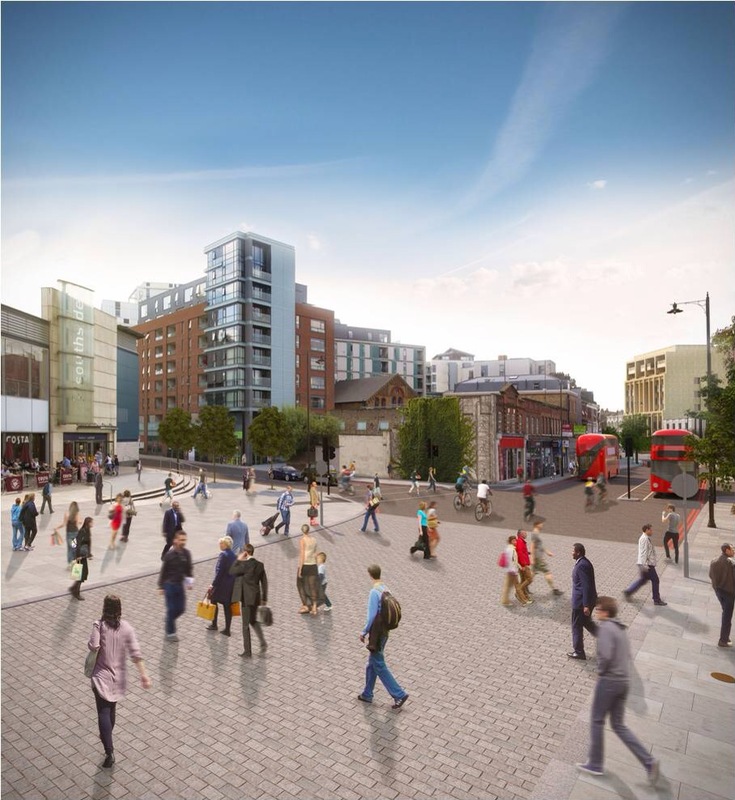 in the weeks and months ahead THE WANDSWORTH VOICE will be following very closely all media articles and council statements into the proposed re-routing of the road systems in and around the currently rather sad High Street. Disruption there will be, whatever the scale and nature of the final scheme. We must ensure that local residents’ views are heard throughout the process and are not summarily rejected by a series of council representatives and TfL folk whose minds are made up already. Add to this, the never-ending growth and impact of the Nine Elms developments – those of us who like living here, and have done so for many, many years, need formal reassurance that in the twilight of our lives these ‘grands projets’ will not be a shocking blight on our brighter borough. East is East and West is West … Unless you’re those fine road builders of TfL – who would have not got far in Roman times as they clearly do not know their ‘orient’ from their ‘occident’ …. And probably not their ‘sinister’ from their ‘dexter’ either …. Two of their fine artist’s impressions appear to be wrongly captioned. The first thing they show is Wandsworth High Street (East) and the second they say is Wandsworth High Street (West). Anyway have a look ….and decide for yourselves …. and then check it out on their website … If you’re as incredulous as we are .. It is with both sadness and regret that we must advise you that the undertakings made by your Mr Richard Tracey, AM, during and following our local meeting with him on September 25th 2014 have not yet been addressed. Whereas the representative of Wandsworth Borough, Mr Jolly, who was present throughout, appears to have put in motion the things he was deputed to do, the promises made by Mr Tracey have been shown to be completely hollow. Sadly, Mr Tracey does appear to ‘have form’ in his dealings with the local people of York Road, Battersea. He did meet them on not dissimilar issues some 18 months ago – and nothing came of that. Their noise and traffic pollution problems have got worse not better. We do ask ourselves whether Mr Tracey is competent to handle both his local AM responsibilities along with his transport portfolio within the GLA. As you may well imagine, we have received a similar lack of response from the local MP, Jane Ellison, whose buck-passing capability among her constituents is now classified as legendary, as well as being risible. We are decent, concerned citizens – we simply ask that our democratically elected representatives do what they were voted in to do – they should not avoid their responsibilities. We are also going to publish this on our website – THE WANDSWORTH VOICE – as well as sending as copy to our local papers – The Wandsworth Guardian and The South London Press. Thank you for providing such a thorough summary of your meeting. Richard is currently pursuing these matters with TfL himself so I hope that the issues will be resolved swiftly. Please find below a summary of a meeting/fact-finding expedition undertaken in Battersea and Wandsworth by Mr Tracy last Thursday at the invitation of Mr Len James of Dungeness House, York Road. Mr Tracy was accompanied by Mr Jolley of Wandsworth Borough. I myself, John Fowler, a friend of Mr James and a fellow resident of Wandsworth Borough, was also in attendance. We would first of all like to thank Messrs Tracy and Jolley for accepting the invitation to come and see/experience for themselves some of the difficulties being experienced by local Wandsworth people in relation to traffic, roads and pavements and other local environmental and general quality of life issues. We felt that the whole atmosphere of the meeting was very positive and we hope that the issues raised will soon be resolved by the relevant parties. 1. A recognition that the width of the pavement directly outside Dungeness House had been reduced to accommodate the cycle lane on York Road. And that this caused inevitable issues for pushchair / pram / buggy users. 2. This on occasion was made even worse when wayward cyclists decided to ride their bikes on the pavement instead of using the cycle lane. 3. Such has been deterioration of the re-designed/re-engineered road and cycle lane surfaces outside Dungeness House that mud/water is thrown up on to the pavement itself. Photographic evidence has been submitted previously – to no avail. 4. The trees along the outside of the old Elteringham School really do appear very vulnerable as the development moves towards its completion, as it transpires that no-one is sure who is responsible for their immediate and future welfare. 5. The lighting under the railway bridge that goes over the Trinity Road has failed – and has not been replaced. Major security problem/risk for pedestrians and cyclists. 6. Deterioration in the road surface under the above-mentioned bridge has caused unacceptable amounts of mud and water to be thrown onto the pavements. The residue of which is very apparent. 7. There are clearly unresolved issues between TfL and Wandsworth Borough as to which of these two illustrious organisations has the responsibility for the management of ‘grassy areas’ on the western side of Trinity Road and beyond into Birdhurst Road. 8. The presence of ‘rat holes” and council-set ‘rat-traps’ along Birdhurst Road is very unpleasant – council officials are aware of the problem and are doing their utmost to resolve it. Even though the rats get bigger and more daring, there appears to be no immediate resolution. 9. The sad prevalence of ‘canine faeces’ on the grassy area along the front of the houses on Birdhurst Road was clear. Mr K James of 37, Birdhurst Road indicated to the representative of Wandsworth Borough Council how inappropriate ‘canine waste disposal’ methods were causing potential health and disease problems. Possibly either because of too few or badly sited disposal units. 10. The condition of the road surface in certain places along Birdhurst Road was all too apparent – major dips, furrows, inexplicable hollows – and nothing apparently has been done because ‘criteria’ for repair have not been met to the satisfaction of Wandsworth Council. Whatever that means. 11. There is no doubt but that the road traffic noise emanating from Trinity Road can indeed be intrusive. Mr L James suggested that different forms of bush/shrub could be planted which would act both as a form of barrier against the noise and whose lack of lower leaves would not allow animals to hide/shelter there or litter to gather there. A two-fold problem could be solved by one single solution. 12. On the corner of the approach to Wandsworth Bridge and York Road stands a very imposing tree. It was feared that such a tree might suddenly disappear because of its proximity to the new, as yet unoccupied, apartment blocks. 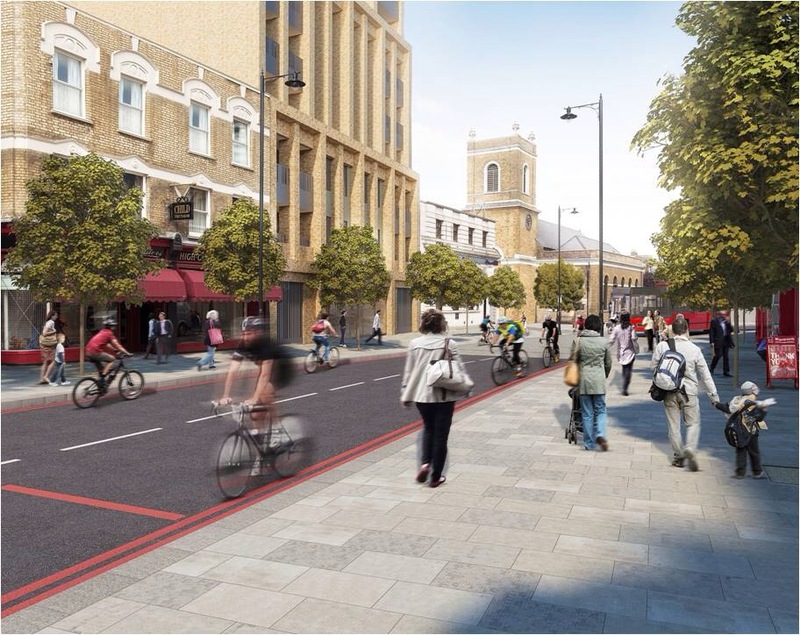 One possible solution would be to extend, simply by several feet, the existing carriage-way ‘divider’ – a form of central reservation – running along York Road from the roundabout eastwards towards Battersea. 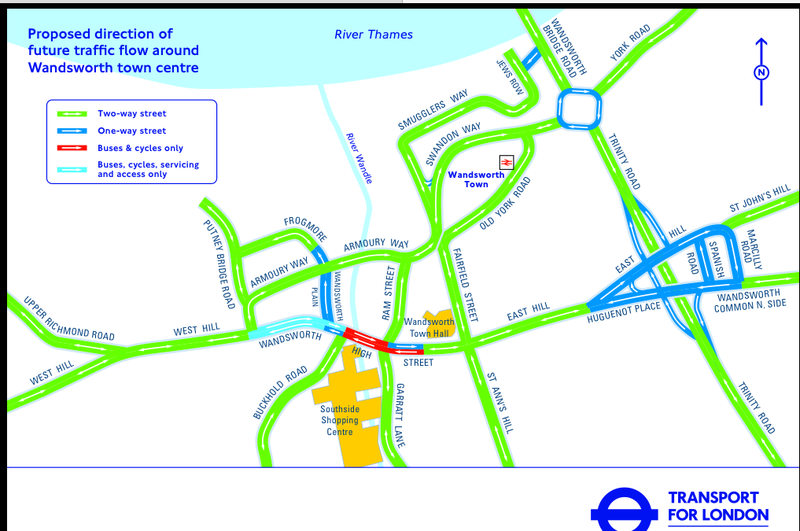 This would prevent direct access from Petergate into Battersea Reach. 14. ‘Through traffic’ continues to use the parking area between Filey House and Dungeness House as yet another way to enter Petergate and then access Battersea Reach. Another ‘accident waiting to happen’. A simple solution would be to ensure that one of the existing gates is locked shut thus preventing though traffic using this essentially residential area as a ‘rat run’. This is all very straightforward and not at all complicated. It is certain to work perfectly without any confusion at all. And there will now be no need to go to the Hampton Court Maze – we shall have one on our doorstep.